This chilly weather has been putting me in the mood for some cold weather comfort food. So earlier this week I whipped up some homemade tomato soup and grilled cheese. Simple, yes. Delicious? You'd better believe it! I used Muir Glen Fire Roasted tomatoes because I like the smokiness. The resulting soup is homey and despite the cream, relatively light. I made a full batch and have been eating it for lunch all week. For the best grilled cheese, I prefer hearty bakery breads rather than standard sliced sandwich bread. We used Whole Foods Rosemary Sourdough. For cheese, we used what we had on hand, havarti. It melted quite well and had more pizzazz than standard cheddar. 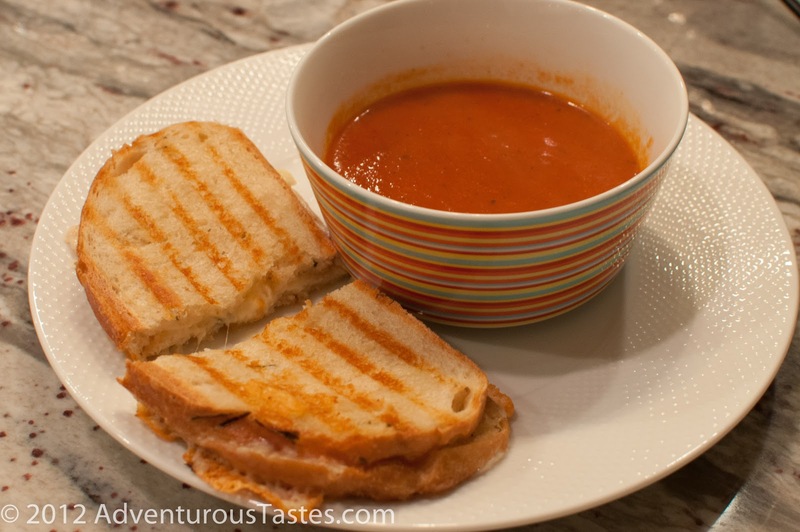 We used a panini press, but you can do it on your stove top just as well. A little rosemary salt from Beautiful Briny Sea and some butter on the bread, and voila, gooey, delicious, crusty grilled cheese! Dip the corner into your soup and you'll be transported right back to childhood.